The car ferry Abel Tasman is best remembered for its years of transporting cars and passengers across Bass Strait, between Melbourne and Hobart, on the island of Tasmania in the Indian Ocean. 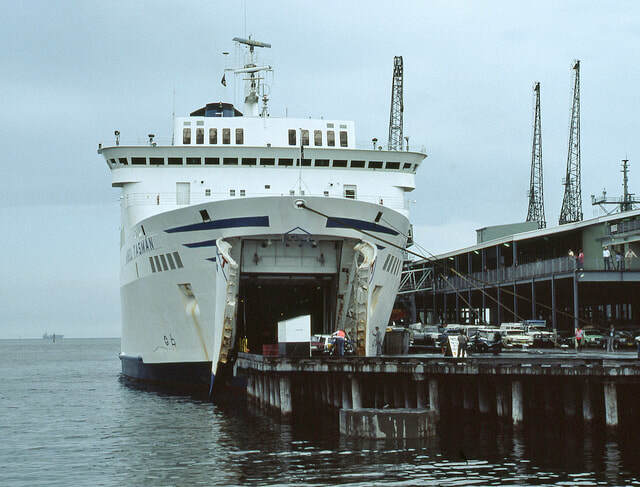 The ship was the first ferry owned by the Tasmania Transport Commission, established in 1985. The ferry remained in service for this line until 1993 when it was replaced by a larger vessel, the Spirit of Tasmania. The Abel Tasman was a work horse at 148.9 meters. Powered by twin diesels, she could carry up to 470 cars and as many as 1,800 passengers across the open waters at a speed of 21 knots. She could load and unload vehicles at both ends which allowed fast and efficient loading and unloading each time she docked. This ship was the work of skilled German craftsmen and was originally named the Nils Holgersson when launched in 1975, ten years earlier. The ship was named for Abel Tasman, the Dutch explorer who discovered Australia, New Zealand and several islands in between in the mid-17th Century. While the first ferry to operate under the government-controlled "TT Line," the Abel Tasman was not the first, nor last car ferry to run the estimated 150-mile stretch from mainland Australia and Tasmania, thus connecting these two states of Australia. The first steamship to run that gauntlet was the wooden screw steamer City of Melbourne, which went into service in 1851. More steamers went into service later that year after gold was discovered in Tasmania and the rush was on. The Tasmanian Steam Navigation Company formed in 1893 to operate steamers between Sydney and Hobart, and later operated several popular steamers on the Bass Strait ferry service. Among the best remembered ships on this line was the Rotomahana, a vessel with a clipper bow and graceful lines, but room for only six cars to be carried on its deck. This ship remained on the run until 1921. The Abel Tasman went into service after the Australian National Line pulled out of the Bass Strait Ferry service in 1985. She continued on that run until 1993 when the state-owned service developed into a corporation and acquired the larger Peter Pan, renamed the Spirit of Tasmania, to replace it. In 1994 the ferry was sold to Ventouris Ferries and renamed Pollux. One year later it fell under new ownership, the Maritime Co. and operated by Nel Lines. She also received her fourth name, Theofilos. At the time of this writing the Theofilos was showing its age, but still operating on the Pireaus-Chios-Mytilini route in Greece.